I am smitten with Korean-style fried chicken wings. I’ve tried a few of the popular ones and keep coming back. So you can guess it’s only a matter of time before I try my hand at making my own, right? 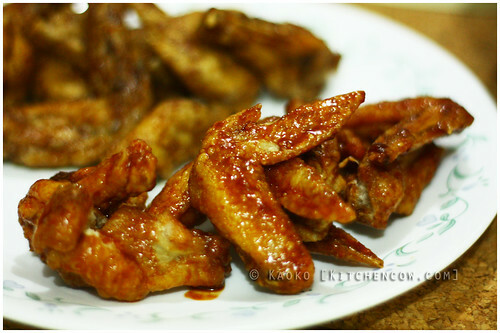 During one of her mad Korean chicken wing cravings, my friend Cla found herself trying a recipe she found online and discovered it to be successful. Curious, I tried it myself and found it pretty good. I tweaked it a bit to suit my own preferences but it’s mostly a winner. The sweetness is just right, complementing the ginger and garlic flavors without overpowering. I did a spicy version relying on gochujang (I skipped the chili flakes and tabasco from the original recipe) which tasted wonderful, too. Clean the wings in cold water. Soak in cold water, drain and repeat twice. Leave it soaking in cold water, draining only right before you boil it. In a pot, bring to boil enough water to cover the chicken. Add the rice wine, salt, peppercorns, garlic and onion. Once the water is boiling, add the chicken. Boil for about 10 minutes. Drain the wings, rinse with cold water and drain again. 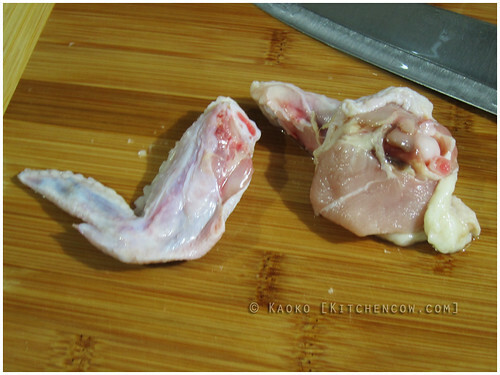 Place the wings in a bag with cornstarch. Toss around until the wings are lightly coated. Fry in hot oil until crisp. Drain then glaze. Mix all the glaze ingredients. Simmer until the sauce thickens to a maple syrup like consistency—it should still be runny, otherwise, it won’t glaze your chicken evenly. In a roomy covered container, add a few pieces of chicken. Drizzle some glaze on top. Cover and shake until the chicken pieces are evenly coated. Use the glaze sparingly, add just a teaspoonful at a time until you find the right amount. Serve and enjoy! For boiling the chicken. See the chicken stock potential? If like me, you enjoy alternating between the soy-garlic and spicy wings, simply mix all the soy-garlic glaze ingredients, then split it between two containers. Add 1 1/2 Tbsp gochujang to one container. 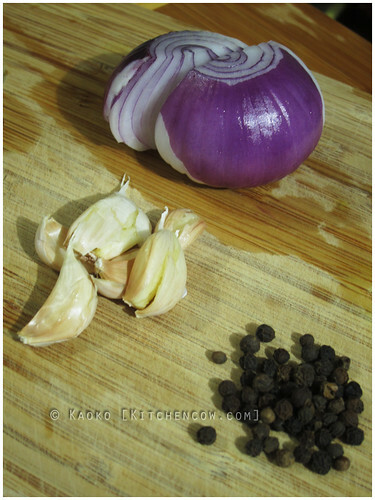 Then, simmer the two sauces separately—first the soy-garlic, then when it’s done, the spicy one. Whatever you do, always do the steps for the non-spicy first (simmering, glazing) so you don’t accidentally spike the soy-garlic with residual gohchujang. While I find the flavors spot-on, I’m still planning on revising this recipe—mostly with the parts involving the chicken. Next version will probably be full-on double fried for maximum crispiness that stays crispy even a couple of hours later. But as to the glazes, I’m already more than happy with this version. If you try this recipe and make revisions, please let me know how it goes. Looking forward to hearing from you guys! Me too. Bad thing about blogging, craving for things that you’ve already eaten. And we don’t even have a Bon Chon nearby so buying is not an option. 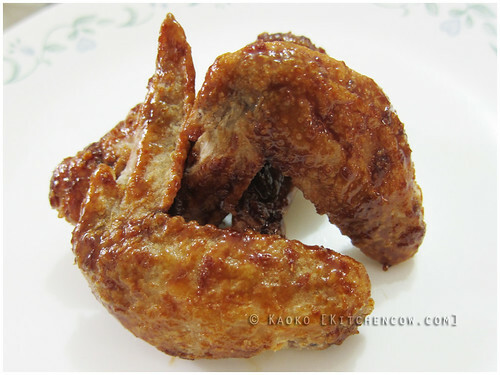 pag nagka time ako, ill really try to make this… looks so good! im sure masarap sha, K! Sana may time ka na! I hope you like how this turns out. Thanks again for sharing your recipe! It looks delicious! Looking forward to how your version pans out, joey! Oh, more than looks, it really is yummy! I made this tonight for dinner tonight and it turned out great! My boyfriend even asked me to make them again some time. I love your blog, the recipes and photos are great! I really want to visit the Philippines some day so I can taste everything you write about! I am so so so so so happy to hear that! More than just hearing about your successful dinner, I’m psyched to hear you’re interested in my country. I hope you do get to visit. It’s so under-appreciated. I’ll wish along with you, Heather! i crave for Bonchon everytime, will this taste like Bonchon’s chicken? Close! The texture isn’t there yet, but the flavors are nice. try some suggestions here. maybe you can find the perfect combination to get the Bonchon texture. Good luck.